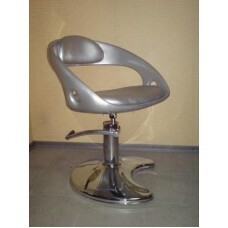 Hairdressing armchair КР023, buy at the price of 284 in Europe. An important element of the interior is certainly a hairdressing armchair. We are pleased to introduce a new model - a hairdressing armchair КР023, which has all the necessary features and allows you to relax as much as possible during the procedure. The crescent-shaped metal base makes an armchair reliable and stable, capable of withstanding heavy loads. The surface of the armchair is made of high quality synthetic leather, which can be easily cleaned using disinfectants. Due to the hydraulic ram, which with a chair is equipped, it is easy to change its height, which is especially convenient for the master, because it does not spend the slightest effort. The use of this armchair confirms all his dignity. Buying hairdressing armchair КР023, you guarantee the success of your salon and facilitating the work of the master!